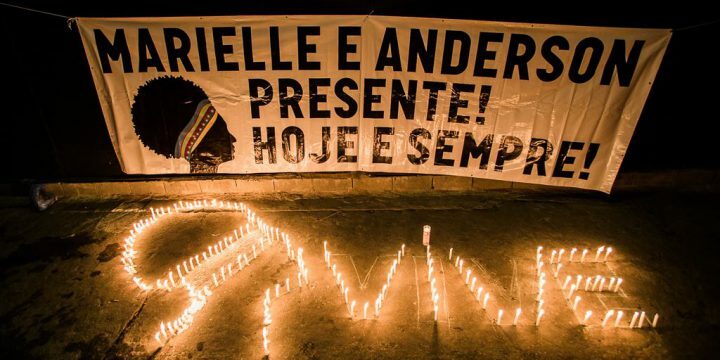 90 days have passed since the assassination of Rio city councillor Marielle Franco. The person or persons responsible for her summary execution have still to be identified. To mark this moment, People’s Palace Projects publishes an executive summary of Someone to watch over me– a two year research project by Eliana Silva (Redes da Maré/Federal University of Rio de Janeiro) and Paul Heritage (People’s Palace Projects/Queen Mary University of London) financed by the Newton Fund as part of a British Academy Senior Research Fellowship. The research involved a survey of 800 residents in three communities of the favela complex of Maré as part of an investigation about public security during the 14-month occupation of Maré by the Brazilian army in 2015/16 as part of what was termed a process of ‘pacification’. The aim was to provide evidence of the impact of the militarization of public security on impoverished and socially marginalized communities in Rio de Janeiro that have been dominated by Armed Criminal Gangs (ACGs). The research reveals the detailed information and territorially specific data that is needed to create a strategic, evidence-based plan for policing vulnerable communities. Recent research by the Igarapé Institute has shown that the cost of violent crime in Brazil is approximately 4.38% of its GDP – a figure which does not take into account the social and human costs of a homicide rate of approximately 170 people per day in which most of the victims are young, Black men from communities like Maré. Brazil cannot afford to sustain such violence. Councillor Marielle Franco grew up in Maré. In a brief but remarkable political career before she was gunned down by forces unknown, Councillor Franco campaigned vigorously against systematic police abuse of residents in Rio’s peripheral communities. Someone to watch over me brings evidence from Maré to inform and shape public security policies that are coherent with the responsibility to guarantee civic rights.